Thought I'd post up a few of the in medias res kits I've got floating around my workbench. 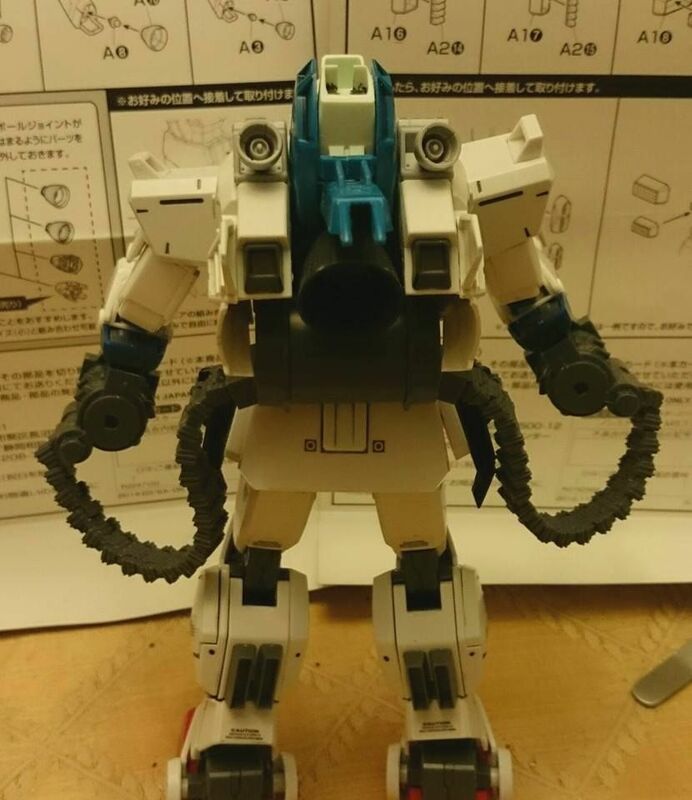 A High Altitude Low Insertion EXperimental modification to a standard RX-79[G] frame. The rear ammo can is field swappable with a minimum of down time. The backpack was originally designed for space use, but the balance was never solid enough to warrant further zero-g trials. 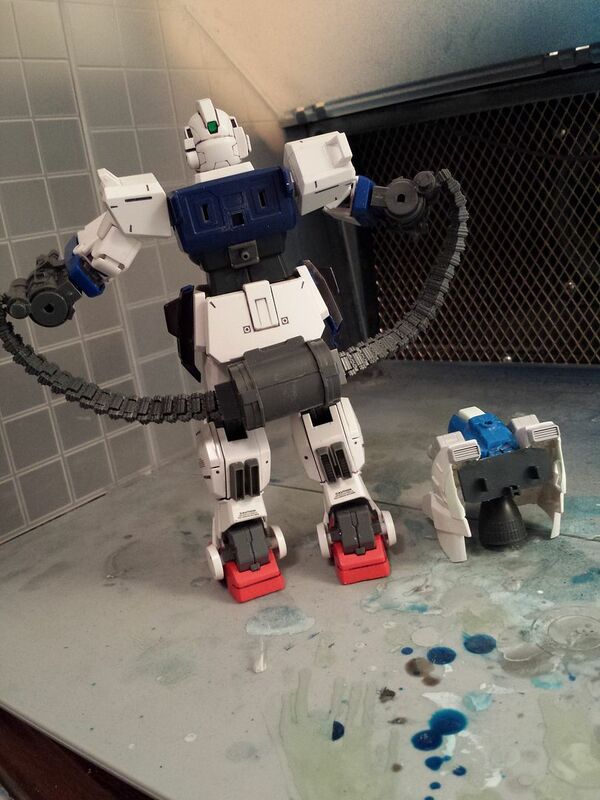 Backpack from a variety of pre-HGUC 1/144 Ex-S Gundam parts and Builder's Parts bits. Gatlings and Ammo drum/chain from the Modelling support goods Hand Gatling and Belt Link kits. mmmmm combat practicality. you seem like you would enjoy this thread. http://www.gundamforums.com/showthre...nd-development i know it looks like a lot of reading but it really does not take long. i LOVE things that make practical sense. also your HALIEX would benefit from a parachute. using a parachute would keep you from having to use fuel on the drop to slow your decent. That's a good point on the parachute - I'll have to figure out a place to put it, but I like the idea. Thanks! I've got a lot of detail stuff to sort out, like the chest details and other little bits, but I'm pretty happy with how it's coming along. Thanks! I tried to keep this one as at least sort of modular - the backpack and ammo can aren't fixed in place, and the gatlings have the same sort of connector as the ammo cans. Not that I have any other modules yet, but the option is there. The ammo thing is gonna be a big higher up right? Like the previous pics? OK that's what I thought. I'm loving it though. Good to know those hand gatlings are kinda small. Yah - there's a bigger gatling I've got too, but these felt a lot better sized for this build. You needed two of them right? Only one comes per set? Yes, and the Belt Link also come one chain+can per set. those guns are the perfect size for it. 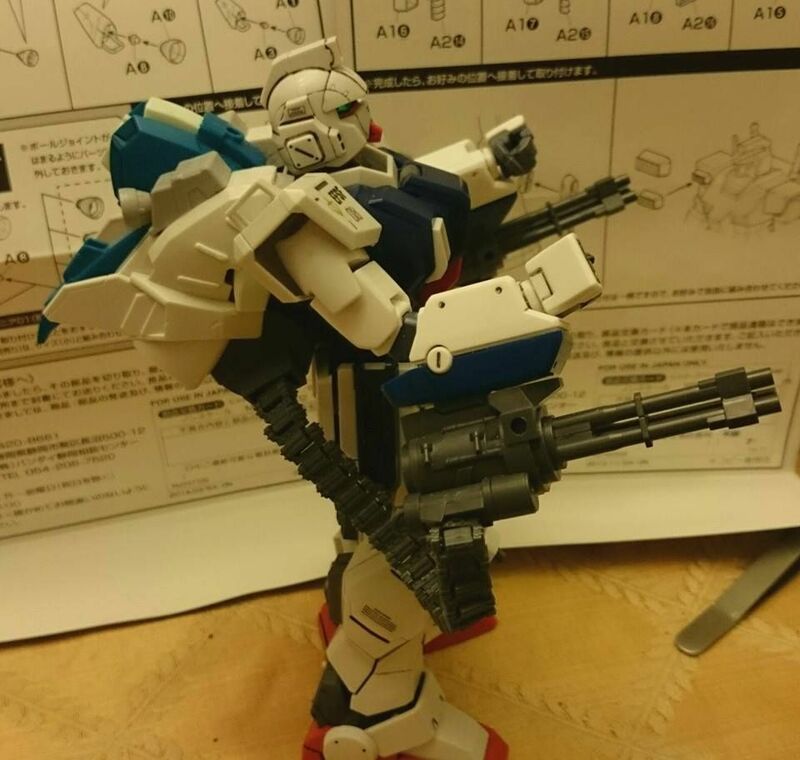 I'll agree with Zaku on the guns, they are the right size for this build.